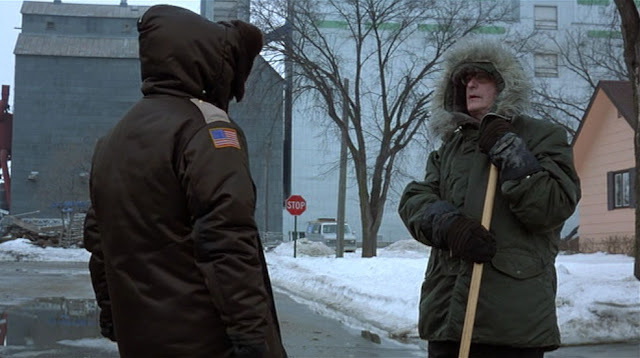 One of the great joys of Fargo, and one of the great joys of the Coen brothers in general, is the richness of the characters. From mute Marlborough Man assassins to lovelorn high school alumni, Fargo is a world populated by a whole host of beautifully drawn weirdos. But while they’re funny, tragic, strange and most definitely larger than life, they never feel unbelievable within the Coen’s universe. With everyone hitting just the right note, they’re the main reason we buy into the Fargo reality. They’re as much a part of the landscape as the snow on the fields and the blood in the wood chippers. Each character is a person in their own right and even the supporting roles, like Norm-son-of-a-Gunderson, feel like they exist beyond the ninety minutes of film. In fact, one of Fargo’s most intriguing characters and perhaps its most quintessential, is only on screen a matter of minutes. But this fleeting appearance is not only wonderfully memorable, it is structurally speaking, one of the most important scenes in the film. Amidst the kaleidoscope of colourful characters, there are two main players at the heart of Fargo’s madness: Jerry Lundegaard, a car salesman in way over his head and Marge Gunderson, a pregnant police chief hot on his heels. When Lundegaard (played by William H. Macy) gets himself into financial difficulties, he hires two thugs, Carl Showalter (played by Steve Buscemi) and Gaear Grimsrud (played by Peter Stormare), to kidnap his wife with the intention of securing a substantial ransom from his less than affectionate father-in-law. But when things get out of hand, Carl and Gaear murder a state trooper and two witnesses, prompting Marge(played by Frances McDormand) to launch an investigation involving dopey hookers, snippy suspects and some canny police work. But while the case makes steady progress, catching up with Showalter and Grimsrud proves tricky, and as the film enters its final chapter, Marge still seems pretty far away from catching the hired killers. At least, that is until we meet Mr Mohra. Played by Bain Boehlke, Mohra contacts local authorities after a run in with an unsavoury loud mouth that we presume to be Showalter. In his one and only scene, Mohra informs a police officer that he was threatened in a local bar by a “funny looking guy”, who boasted that the last person to get on the wrong side of him is “dead now” and not of “old age”. Having heard about the recent homicides, Mohra, at his wife’s behest, thought he should “called it in” and tells the officer that the man in question made several references to a lake, where he presumes he must be staying. Neither Mohra, nor the police officer believe there’s much in the man’s claims, but it’s this tip off that leads Marge directly to Grimsrud and what’s left of Showalter. For this reason, Mohra’s three minute scene cannot be considered anything less than essential to the film. Of course you could argue that after the police caught up with Lundegaard, it would be only a matter of time before they tracked down Grimsrud and Showalter, but this would deny the audience the catharsis of a climatic showdown. The nature of Fargo’s narrative demands that Marge be the officer to apprehend the killers, but without this lead she would never have been able track them down, at least not in the neat way seen in the film. The scene is therefore vital for the sake of plot progression. But what could have been a run of the mill witness report, inserted purely to wrap up the story, is made fantastically memorable by a wonderful performance and hilarious dialogue. The officer deployed to Mr Mohra’s residence is barely out of his car when the witness launches, pretty much unprompted, into a breathless, one take monologue that just keeps going and going. As if possessed by a dot matrix printer, Mohra’s monotonic testimony fills the scene with a steady chug-chug of dialogue, as one sentence blends seamlessly into another with barely a whiff of hesitation. He’s like a child’s toy, wound up and let go, giving the police officer little chance or reason to contribute anything to the conversation. It’s a scene that’s funny and mesmerising in equal measure. But for all its delights, this chance encounter and stroke of luck for the investigation, actually seems like a bit of a cheat when you really think about it. Having followed Marge from the initial discovery of the bodies, through the entirety of her investigation, to have a new character step in for one scene and essentially say, ‘the murderers are over there’ could be seen, at least in story telling terms, as a little unsatisfying. In many ways, this is perhaps a more realistic conclusion to the events, as one imagines many cases are often solved by somebody completely unrelated simply “calling it in”. But in filmic terms you could say it’s a bit of a cop out. You would think the more satisfying conclusion, from an audience point of view, would be for Marge to track down the killers through her own grit, determination and investigating prowess. At least, that’s how they would do it in other films. But this is the Coen’s world and nothing ever happens as you might expect. It is testament to their skills as writers and to the performance of Boehlke, that the audience don’t feel cheated. In fact, you barely notice what they’ve done. By creating a character so enjoyably unusual, with dialogue so odd, they distract you from their little storytelling short-cut. Like a magician leading your eye, the scene has just enough razzle dazzle to draw your attention from its true purpose. You don’t realise the bridge in the plot because you’re so wrapped up in the one man show that is Mr Mohra. The scene is almost like the Coens writing themselves out of a corner. But they do it with such style and humour that you can’t help but forgive them. In fact, far from feeling less satisfying, Fargo actually feels richer for having the scene. Because it’s an excuse for the Coens to introduce another gloriously bizarre character. And that, after all, is what they do best.